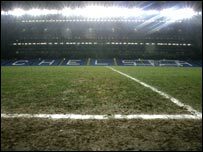 Chelsea have denied suggestions they are sabotaging their own pitch ahead of the visit of Barcelona. The two clubs were involved in a row last season over the state of the Stamford Bridge pitch. But a Chelsea spokesperson said: "An 18-day break between home fixtures has allowed our staff to carry out routine maintenance work on the pitch. "There are few times in the season when we can ensure our pitch remains in perfect condition." Barcelona were highly critical of the pitch ahead of the first leg of their second round tie, which the Spaniards won 2-1. Ahead of the game skipper Carles Puyol said the pitch would harm their hopes of winning. Puyol claimed their watering of the pitch would stop Barcelona's free-flowing style. Barca went through to the quarter-final after a 3-2 aggregate victory over Jose Mourinho's side.